top: The very medieval scholar’s robe. I suppose the bag-like sleeves were originally intended for carrying around one’s scholarly scrolls. 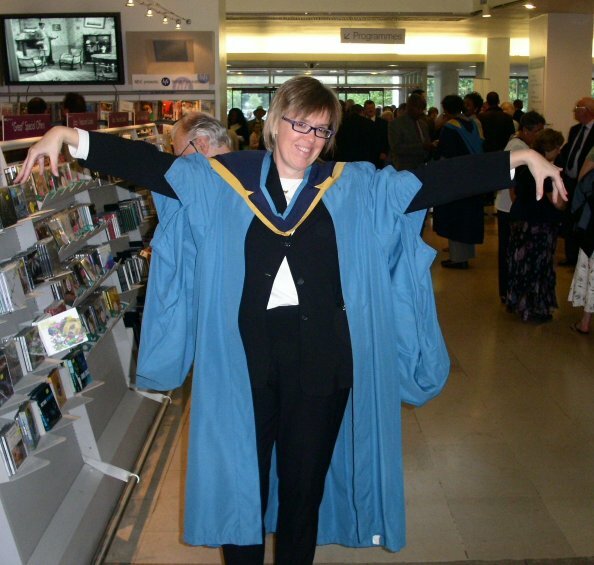 I went to London to collect my MBA from the Open University. Attending the ceremony was not obligatory, but I’d missed my BA graduation, and thought it would be fun to do the cap and gown thing. The ceremony was held at the Royal Festival Hall, where we were supposed to arrive early to collect our (rented) gowns and have official photos taken. 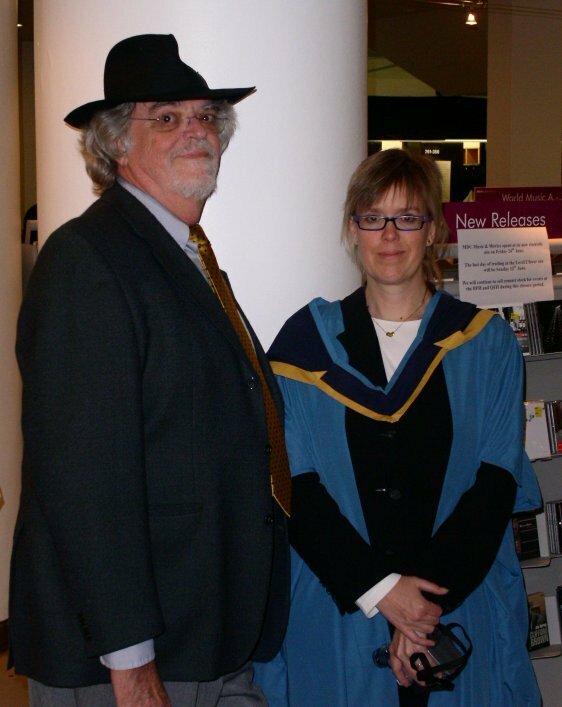 The Open University holds around 20 such ceremonies every year, giving graduates a broad choice of places and times to attend. Several hundred people were present that day to collect degrees from BAs to PhDs in every conceivable subject, accompanied by their beaming families. We were a representative slice of what is probably the world’s most diverse student body. 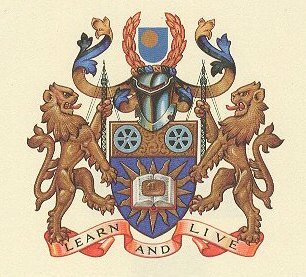 The Open University was founded (in 1967) to open up education to people who otherwise had not had and might never have the opportunity to pursue a university degree. The institution has succeeded wonderfully at this. Few of the graduates were the usual college age; the oldest I saw looked to be well into her 70s, and she wasn’t the only grandma in the group. Many were non-white, with a large contingent from Africa (Somalia and/or Ethiopia, I think), where the OU has been operating for years. Most of us graduates didn’t know each other, but each had a small cheering section of family, in my case my dad and his wife Ruth, but it was more common for graduates to be attended by their spouses, children, and even grandchildren! Like everyone else, I rented the gown and hood, and was carefully allocated the items pertaining to my newly-attained qualification. 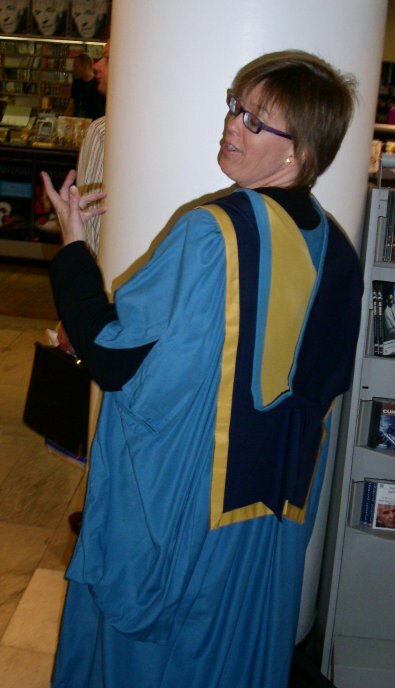 The pale blue robes are for Masters (Bachelors wear dark blue, Doctors shiny electric blue). If you’d like to learn more about the Open University, there’s a new site (2014) for students outside the UK and Ireland. I started this degree in 1999, when I realized that, if I had had to apply for the job I was actually doing at Adaptec, the description would have said “MBA strongly preferred.” My original intent was to show my bosses that I was serious about my career, in spite of the strangeness of my situation (working long-distance from Italy for an American company). This entry was posted in bio and tagged bio, MBA on July 5, 2005 by Deirdre Straughan. The Open Univerity is one of those quirkly bits of British culture. The tradtional image of an early morning show with a 1970s beardy explaning something over the heads of most viewers is fairly common, though long out of date. Interesting article. Love the photo of you and Alton.